* AVALANCHE DANGER...Very dangerous avalanche conditions exist. The avalanche danger is HIGH (Level 4 of 5). Very large avalanches are occurring in the Lake City area. 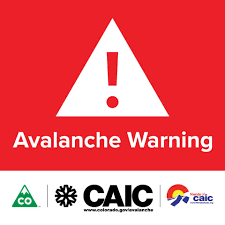 * REASON... Intense snowfall, strong winds, and warm temperatures at low elevations have made avalanche conditions very dangerous. Large and destructive avalanches are likely.